I don’t know about you, but I have been taking public transport ever since I was old enough to take the bus on my own. And during the olden days, your reaction had to be quick to pull down the windows when it rained, lest you get soaked from the raindrops that got in. Then the MRT came along and I still remember getting on the train with the family on the first day of opening and receiving a golden ticket as a memorabilia. I do have a driving license, but never had a car due to financial considerations. Thankfully for the excellent transportation network in Singapore, I was never truly disadvantaged though. Getting from one point to another in Singapore is always a breeze, be it via bus or MRT, and needless to say, by the more expensive taxi as well. Travelling solo and later as a couple is definitely no problem for anyone, but when our kiddos came along one by one, there were skepticism amongst friends on how we will be able to manage. Don’t be fooled by our expressions, we have no problems travelling by buses and trains. We were just whiling our time taking wefies. And what surer way to get to our start point early in the morning than the MRT? 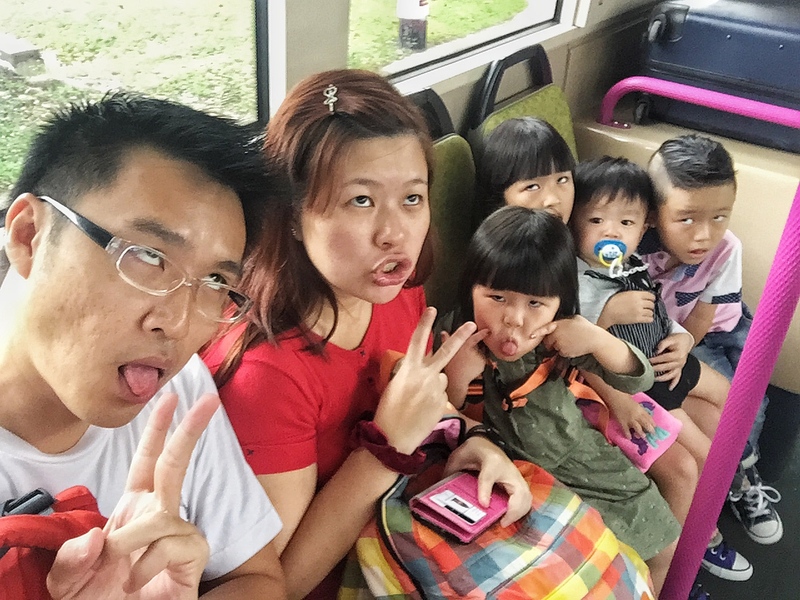 This is a wefie of us on our way to a run in Sentosa! But manage we did, and without too much of an effort too since most commuters we met on buses and trains were really considerate and would almost certainly offer the kiddos a seat. 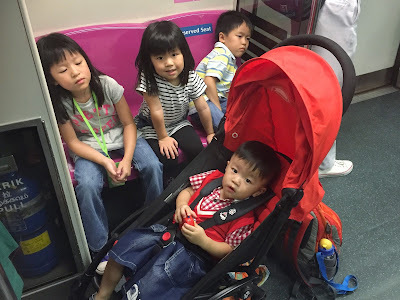 I do travel with the 4 kiddos on my own once in a blue moon and I even had aunties or grannies offering to help take care of them along the journey. Sometimes I wonder if they are apathetic or secretly thinking that this man-mom or “perfect” father probably cannot manage on his own, or both. But either way I wouldn’t mind any extra help! From the moment you enter the gantry, you will know when the next train will arrive and make a decision to walk or double up to catch it. Despite the built up during the mornings, you can still expect orderly queue on both sides of the doors. This is what I have to deal with when I try to get to work with the rest of Singapore! 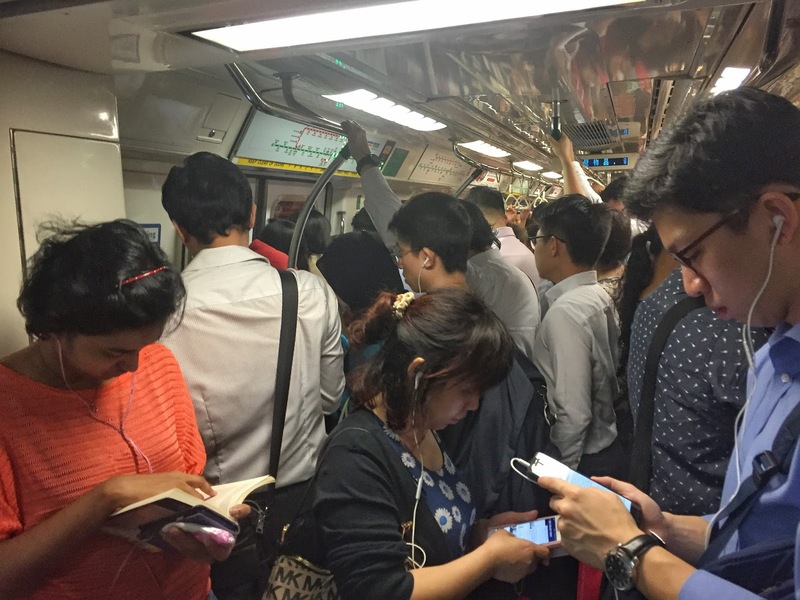 During the peak hours on the North-South Line! 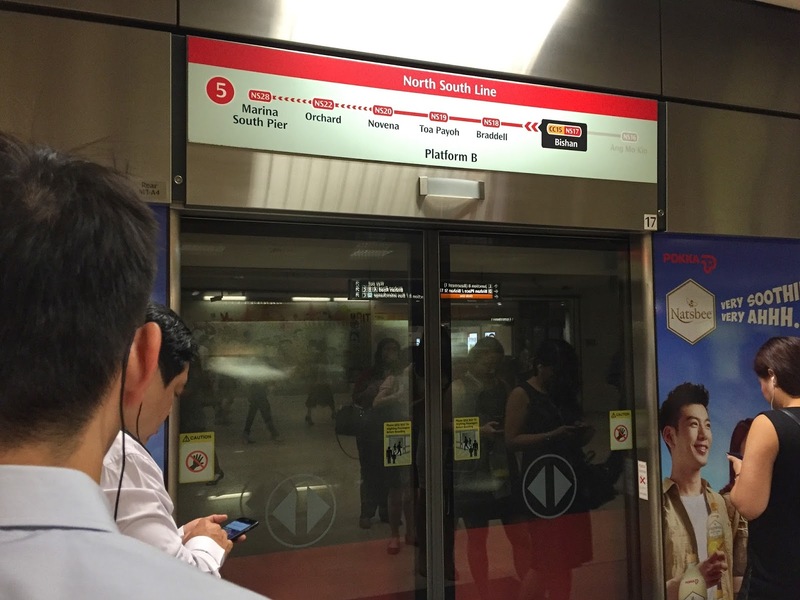 Now look at the difference during off-peak hour. Although this is on the NEL line. Well, this is me, taking all the kiddos out on my own! The moment passengers see the kiddos coming in, they all rushed to offer their seats to them! 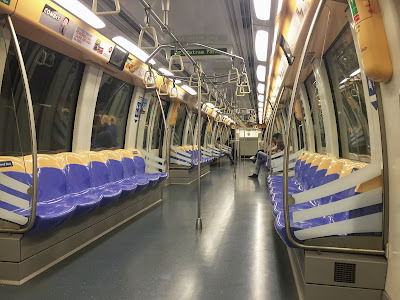 Besides saving money (from having to buy and maintain a car) by taking public transport, did you know that you can make money from riding on the train as well? Let me tell you about Travel Smart Rewards and explain a little about it in layman terms. What is Travel Smart Rewards? It started off as a pilot program called Incentives for Singapore’s Commuters (INSINC), and basically what it is trying to do, is to try to shift the crowd during peak hours. But how to get Singaporeans to participate? Simple, reward lor. 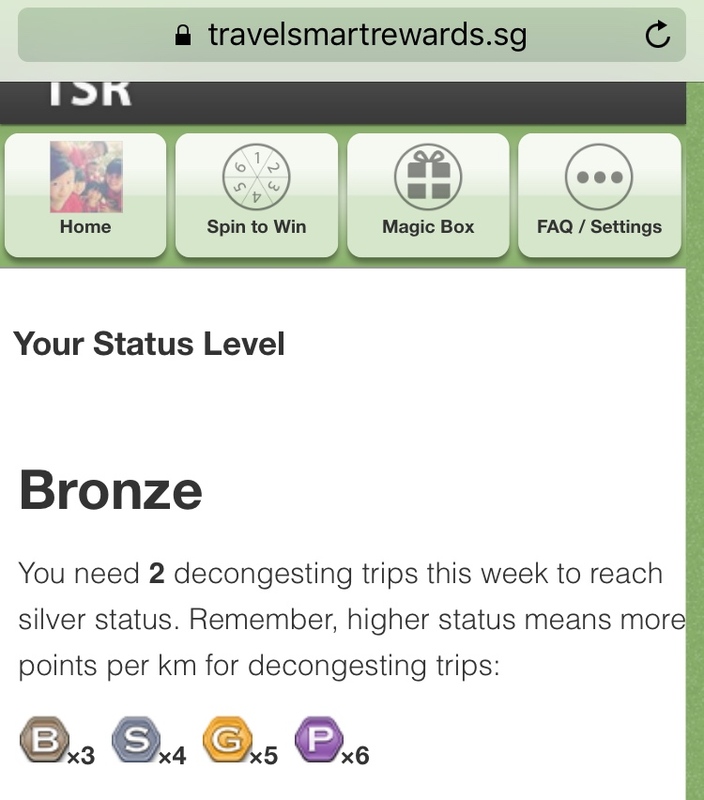 Now, you accumulate 1 reward point for every 1km travel on the MRT or LRT, and depending on which tier you are currently in, the points can be multiplied by a factor of 3, 4, 5 and even 6 for Bronze, Silver, Gold and Platinum respectively. Any commuter using a CEPAS card is eligible to apply and participate in the program by registering at http://www.travelsmartrewards.sg. Your application will be reviewed and an email notification will be sent once it is approved. How to move on to the next tier? All you got to do, is to make consecutive decongesting trips on the MRT. 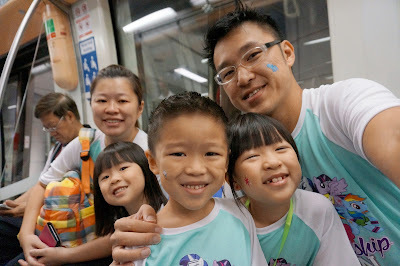 Decongesting trips are simply trips made on the MRT between 6.15am – 7.15am and 8.45am – 9.45am which will award you up to x6 points. You will be able to see how many more trips are required for you to move on to the next tier. Got points so what? Can eat meh? With the points you earned, you have 2 options. You can either select the “Cash Buyout” option, and convert the point to cash at the rate of 1,000pts to $1 or you can choose to try your luck with the “Spin Game”. It is basically a snake and ladder game where landing on the correct tile can get you prizes from $1, $5, $10, $20, $50, $100 and even $200! Every month there will also be a lucky draw prize of $1,500! 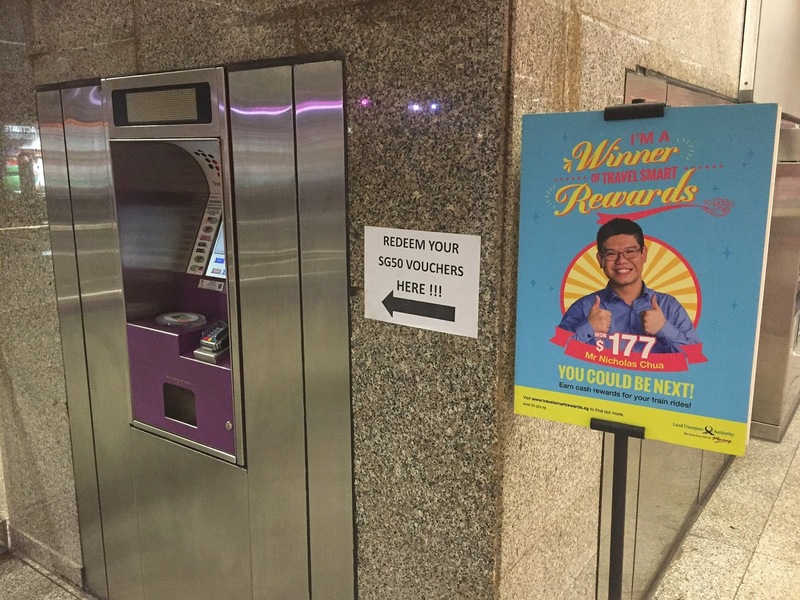 If you had looked around the stations, you will find these posters with real life winners of their top prizes. I have my own doubts when it comes to lucky draws or games, especially so when they are electronic ones. I know for a fact that there are winners for the small prizes because I had won quite a fair bit of $1 and $2 prizes. But what about the big prizes? Do they really exist? 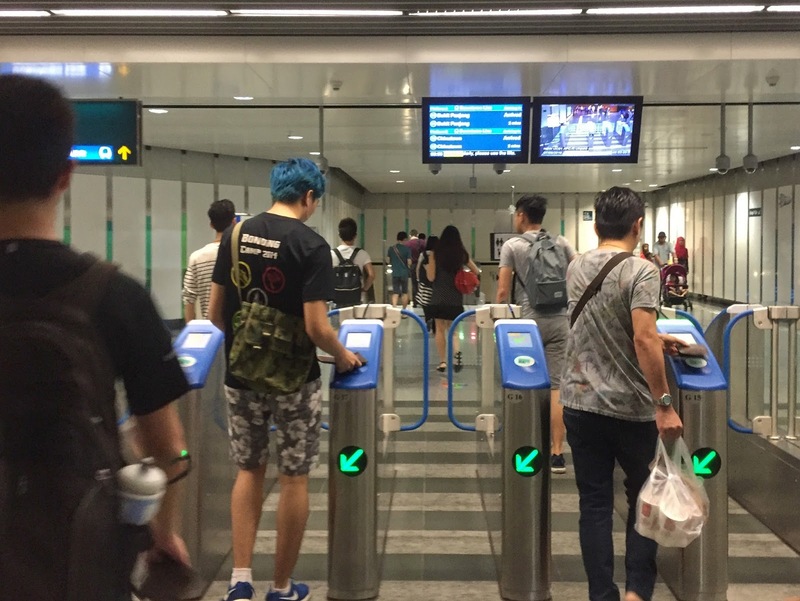 I was chatting with a colleague over tea break a couple of weeks back and talked about this reward program, and saying how many friends and family still do not know of this rewards program despite needing to travel by train every day. This was when my colleague concurred and told me that he actually won $200 from the game before (albeit in year 2013), with proof too! 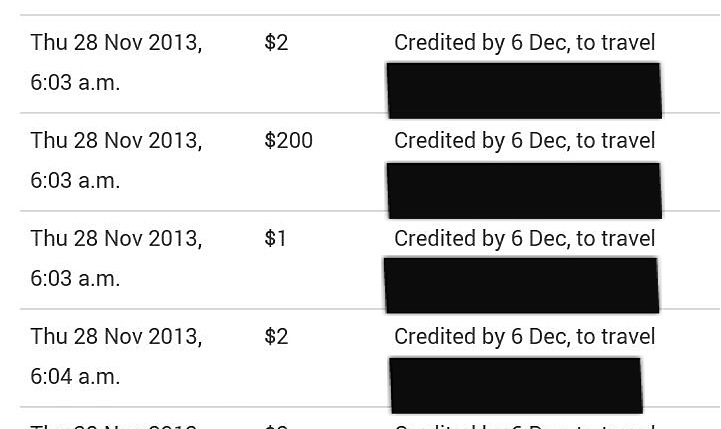 So now I am looking forward to be one of the big winners, or better still, the $1,500 lucky draw prize winner! In any case, it makes sense for me to travel to work early, tap in before 7.15am to earn more points on Travel Smart Rewards, and then exit the gantry before 7.45am so that my MRT ride would be free (https://www.lta.gov.sg/content/ltaweb/en/public-transport/mrt-and-lrt-trains/travel-smart/for-commuters.html)! Who knows, maybe being there to greet the boss in the morning may make a difference to my salary in the future too? This is the fourth year that Travel Smart Day is being held and the Guest-Of-Honor for this year’s event is none other than Senior Minister of State Mrs Josephine Teo. 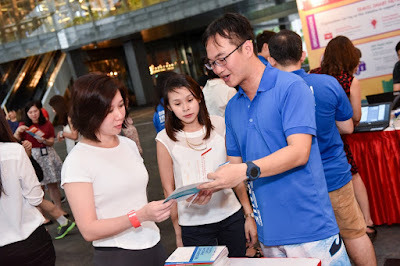 The event was held at Asia Square this year and there was an open invitation to companies and public members to sign up for a morning workout which consisted of Body Balance and Pound (a first in Singapore!). 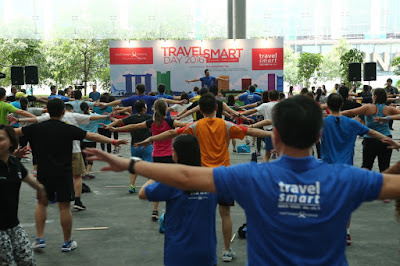 Look at all these people who came down for a morning workout right at Asia Square! 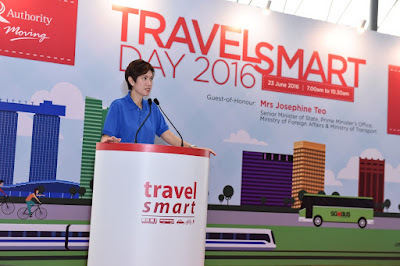 GOH Senior Minister of State Josephine Teo at Travel Smart Day 2016, on 23 June 2016. 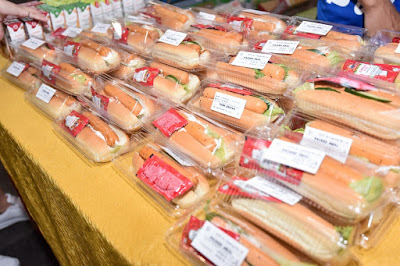 Free breakfast for the public! You too, can travel smart and earn cash prizes like them. 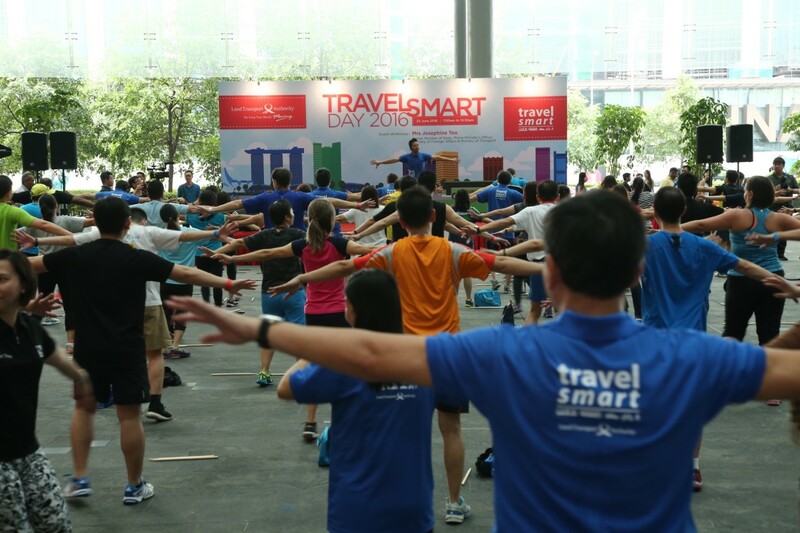 Besides the morning workout and breakfast spread for the travel smart companies and public, the uninitiated were also able to find out about the Travel Smart schemes at both the public commuter and corporate level. Companies in Singapore can take part in the Corporate-tier Travel Smart Rewards scheme which rewards more points (2 additional points per km during decongesting periods!) and gives employees more winning chances. Employers can also tap on the Travel Smart Consultancy Vouchers of $30,000, to hire a LTA approved consultant to conduct a catered Travel Demand Survey for your company. Last but not least, the Travel Smart Grant allows companies to act on their employee’s feedback and implement Travel Smart initiatives with co-funding from LTA. You could get benefits like free breakfast and discounted gym membership from your company! If you are interested in the corporate schemes under the Travel Smart Network, do approach your HR department and encourage them to find out more from LTA’s website. 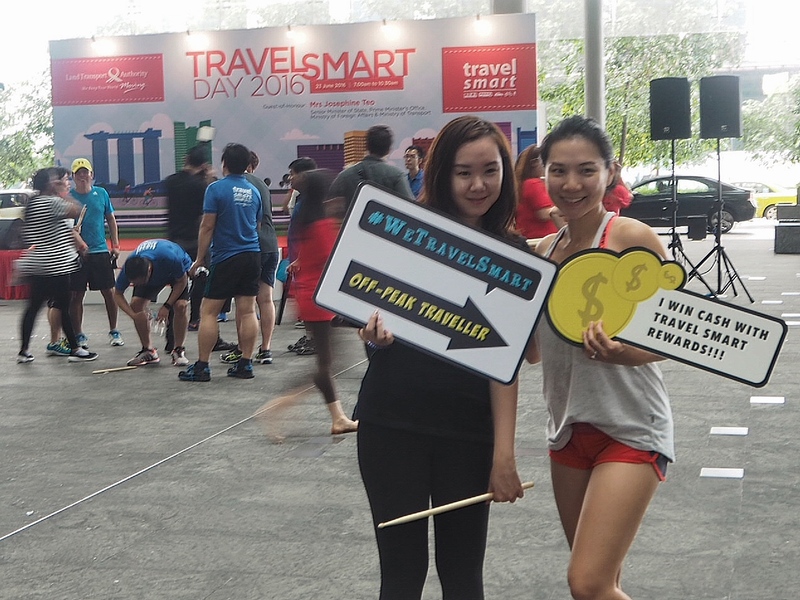 Check out this video to see what Travel Smart Day 2016 was all about!